These gluten-free and vegan Creamy Toasted Warm Spiced Potatoes make for one big bowl of comfort food with their delightful blend of flavors and textures! 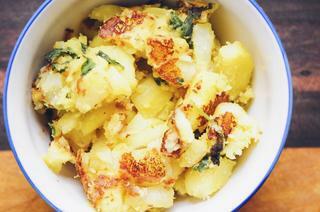 This is one of my favorite ways to eat potatoes; and it makes for one warm, comforting and hearty dish! The combination of (ever so subtly spicy) spices adds a beautiful flavor without any over-powering heat. Great alone, as a side dish, or served with a favorite condiment - this tasty potato bowl will satisfy the taste buds and warm the heart. . .
Peel, chop, and rinse/drain potatoes. Set aside.In a large saucepan over medium-low heat, heat olive oil.Sauté onion and garlic for 5 minutes.Add cumin seeds, cloves, and the Thai chili to your pan. Turn heat to medium, stir & cook a few minutes longer.Stir in your potatoes, salt, pepper, and turmeric. Turn heat to high and cook a few minutes more while stirring continuously.Add water to the pan until potatoes are just covered.Cover, bring to boil, and reduce to simmer. Simmer for 10 minutes.Remove lid, turn heat to high and cook until all water is evaporated - about 15-20 minutes longer.Turn off & remove from heat when you hear a crackling sound & can smell your potatoes browning (or flip an edge a little to check).Throw in a handful of mixed greens, cover the pot, and then let it sit for 5-10 minutes to wilt & then cool. Remove the thai chili (the flavor has been extracted) before serving!Enjoy!